DK Eyewitness Travel, 9781465441102, 296pp. DK Eyewitness Travel Guide: Norway will lead you straight to the best attractions this breathtaking country has to offer. Explore Norway region by region, from the enchanting Northern Lights and beautiful fjords to the vibrant Oslo nightlife. Experience the culture, history, wildlife, and architecture of Norway with walks and hikes through dramatic landscapes and scenic routes, and guidance on Norwegian cuisine. Whether you are whale watching, exploring museums, or hiking across spectacular mountains, this in-depth guidebook provides all the insider tips you need. 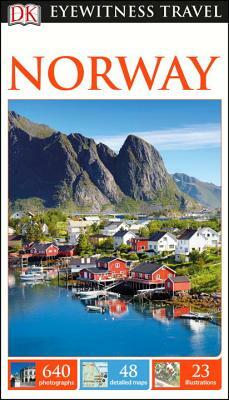 Discover DK Eyewitness Travel Guide: Norway. With hundreds of full-color photographs, hand-drawn illustrations, and custom maps that illuminate every page, DK Eyewitness Travel Guide: Norway truly shows you this country as no one else can.